Lucifer explores the ideas of religion and faith when a priest comes to the Devil for help and ends up forging an unlikely friendship. As a show, Lucifer hasn’t really dealt with religion as an idea in any great depth. There’s lots of mention of how it all really works but in terms of the effect the whole thing has on humanity the exploration has been fairly light. There was some discussion of Chloe’s stance on the whole thing but that has been about it. The exploration of religion comes from Father Frank Lawrence (Colman Domingo) who seeks Lucifer’s help on a case that is -as usual- uninteresting. What they are working on doesn’t matter as the fact that they are working together is what the episode decides to focus on. Having the Devil himself working with a Priest is already a compelling idea that creates potential for interesting situations and the episode largely doesn’t disappoint in this regard. Lucifer obviously represents sin and everything bad in the world where Frank is a representation of forgiveness and everything good so there’s a conflict right there. It is identified early on that Frank still has really sinful thoughts as he reacts to Lucifer’s urging to confess what he really wants to do. Interestingly Frank doesn’t shy away from it and admits that the potential exists within everyone. Lucifer finds it difficult to disagree with him and starts to see that it shows real conviction to work to overcome your own shortcomings. 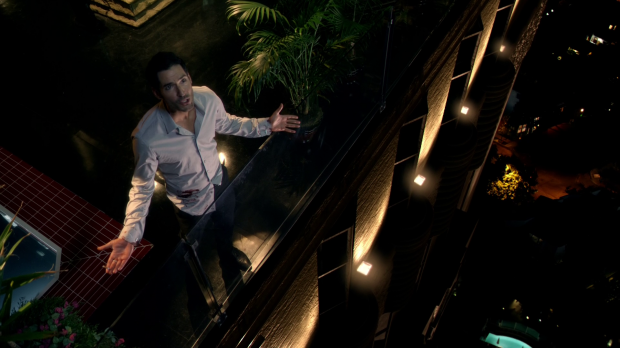 As the episode progresses Lucifer gradually comes around to the idea that he actually likes Frank. We frequently see him surprised by how progressive and insightful Frank is as well as being all around likeable. It becomes really easy for Lucifer to forget why he is supposed to be on the opposite side. Their debates throughout the episode really show this as Frank is able to counter everything Lucifer says about the way things work with a demonstration of how his faith allows him to accept those things and hope for a better future. Extra depth is added to Frank by the fact that he is someone who has redeemed himself by turning his back on a sinful life and finding purpose through his own faith. It isn’t handled in a condescending way by saying that everyone needs to find God and Colman Domingo plays his part earnestly in a way that never feels preachy. Not preaching to the audience is the best way to bring across these complex arguments as religion isn’t for everyone and the episode suggests that faith is a really broad term. This is shown when Frank shows faith in the inability of someone to shoot him. He is devoted to God but also believes in his fellow man whether they are religious or not. This unique insight probably comes from his colourful past that allowed him to see the world as it really is before committing to making it a better place in his own way. The friendship between Lucifer and Frank is handled wonderfully. I loved how the actors bounced off each other and how their debates remained respectful despite the fact that they never agree on anything. Frank also makes Lucifer start to see his relationship with his father in a different way while bringing his own spin to the old “God has a plan” saying by questioning why such a plan has to be a good one? Frank’s only answer to that is having faith that it’s a good one. 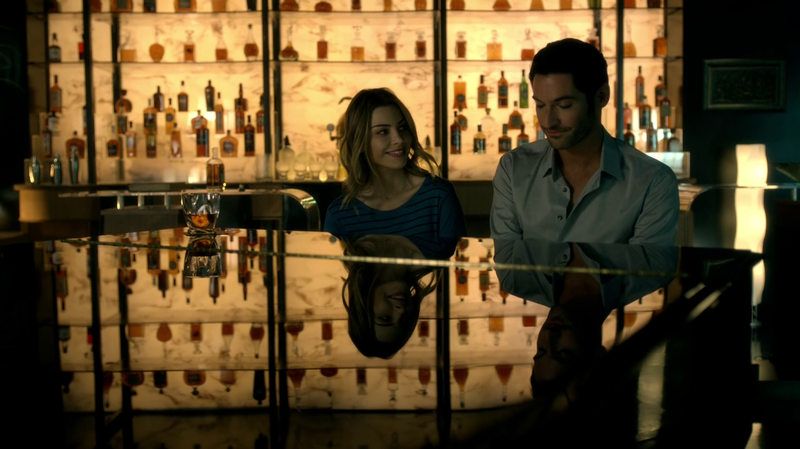 The highlight of the episode was the scene where Lucifer and Frank played the piano together. It starts out as them competing to see who the better player is and results in a duet where they genuinely enjoy collaborating. It acts as a microcosm of their entire relationship and is a fun scene to boot. 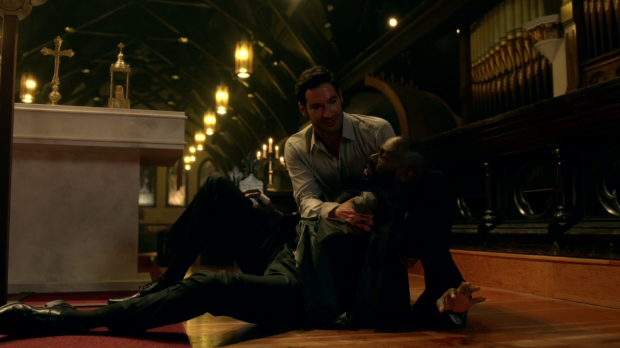 Frank’s death causes Lucifer to become angry and almost kill the one responsible. The fact that he stops himself suggests that Frank had a greater effect on him than he thought. It has been established that he is changing but developing a conscience doesn’t seem to be one of those changes at this point. I feel that he refused to kill out of respect for his dead friend. His direct challenge to God over why people should bother trying to please him as nothing ever seems to be good enough brings a long standing issue that he has with his father to the forefront and the desperation in Tom Ellis’ voice as Lucifer is begging for an answer is really powerful. His final honour to his friend by playing “Knockin on Heavens Door” on the piano is the final sign that he was been altered by this experience in a way that he didn’t expect. Chloe appearing to show some support by participating in a duet of “Heart and Soul” was a great ending for the episode that showed the friendship growing between Chloe and Lucifer. Chloe is being handled a lot better as the episodes progress. She was more of a background element than usual but she still served an important purpose in furthering the story that concerns Dan. After their kiss last week she is determined to find out what it meant and wants to figure that out with him. Dan is being deliberately evasive which doesn’t seem to register quite yet but the secret he is keeping is definitely a barrier to their relationship. I’d say that Chloe doesn’t notice as he focus is more on Lucifer and the case she is working on. She postpones the discussion with Dan to make sure that Lucifer is alright which further shows how close they are becoming. Plus it’s always good to see a rare smile from Chloe. These characters definitely function better as friends and shouldn’t have any romantic entanglement. Dan is finding his situation is a little difficult to deal with. Malcolm is casually extorting him and clearly enjoying it. He manipulates his way into becoming Dan’s partner by threatening Chloe and Trixie if he doesn’t cooperate. Kevin Rankin plays him as being unflinchingly malicious in a way that makes Malcolm feel like a powerful threat. This is definitely one of those situations where Dan wishes Malcolm had died and I can’t really blame him. It turns out that Amenadiel brought Malcolm back so that he would be owed a favour. He wants Malcolm to kill Lucifer so that he returns to hell and gets Amenadiel out of the situation of having to run it. I wonder why Amenadiel chose to resurrect Malcolm rather than find some other criminal to do his dirty work for him. I’m sure he could even hire a hitman to do the job. It’s possible that making deals is the only way he can directly influence things like that but either way it adds further depth to Amenadiel. D.B. Woodside’s performance is so much harsher than we’re used to in order to convey his dark side. It all shows that the concepts of “good” and “evil” aren’t as simple as people seem to think. I like the fact that Amenadiel let Malcolm into Hell for 30 seconds before taking him out of it to give him a taste of what will happen if he disobeys. Everything is getting darker and more complex which works really well for this show. Maze is still hanging around Lux which must be awkward for her. I got the impression that she was to go altogether not still keep her job but her appearance in this episode didn’t really develop the idea of Lucifer losing his protector. I also found the scene with Linda really pointless. 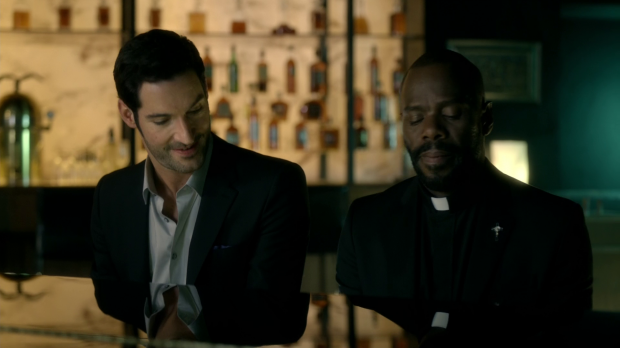 An excellent episode that really capitalises on the potential brought by Lucifer forging an unlikely friendship with a priest. This becomes the focus of the episode which largely distracts from the boring case that surrounds it. The situation between Dan and Malcolm continues to become more interesting and Amenadiel’s role in that only intensifies the drama. I am not going to say much about this episode, except that I enjoyed it immensely. I have had a love hate relationship with Lucifer since it started and I keep waiting for it to get better. It has had a few great episodes and this was definitely one of them! It had everything for me, I laughed a lot and then I cried a lot. It made me happy in a weird kind of way. And that’s all! Thanks for an awesome read.. Again. It has been a really uneven show since the beginning but I really think it’s starting to find its feet in the back half of this season. This one was really good as it focused on the characters rather than the case which iZombie always does so well. I can’t even remember what the case was about this week but it didn’t matter since the focus was elsewhere. Hopefully this increase in quality continues.